Pardon me, ma'm. It sure looks like you're ready to do a lot of walking, judging from all those fancy shoes you're carrying. What brings you to The Flat? Me live here. Me make moccasins, see? Me make pretty moccasins. You like? You got papoose? Maybe you buy moccasins? No got papoose? No buy moccasins? Sorry. Got to go. Got to sell moccasins. Me heap poor. Me got papoose. Papoose cry now. Papoose hungry. Goodbye. Got to go to Flat now. Got to sell moccasins. Me need money. Me go to Dutch Nance store. 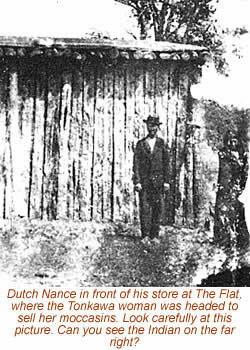 Heap white man go to Dutch Nance store. Maybe today white man buy moccasins. He pay me money. Then me buy raisins for papoose at Dutch Nance store. Dutch Nance got pretty cloth for sale, too. Red and yellow cloth. Me look at cloth every day. Me sell moccasins and buy pretty cloth. Me make new skirt. Me wear new skirt, be pretty. Languages and Traditions: At the Tonkawa camp outside Ft. Griffin, Tonkawa women carried on the traditions of the tribe, one of which was making beautiful beaded moccasins. Living in poverty, many were forced to sell their creations to travellers or ranchers. After living among the Anglos, the Tonkawas began to pick up bits of English that helped them communicate better so they could sell the things they made. This language sounds funny to us today. After reading it, we may think the woman was stupid. But she had to be smart to speak English. It was not her native language. It was her second language. 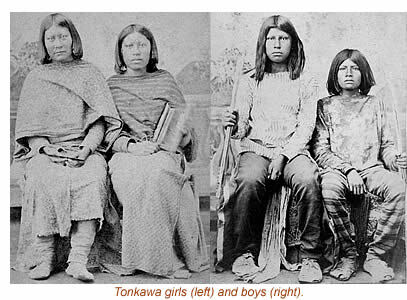 Some Tonkawas even learned to speak Spanish, which made them trilingual. The Story of "Texas Tonk"
Some Tonkawa women served as scouts for the U.S. Army. One scout was a short, fair-skinned woman known as "Texas Tonk." 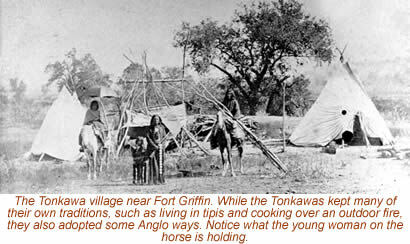 In June of 1872, Texas and other scouts rode out of Fort Griffin with soldiers from the 10th Cavalry. After a long day of scouting, the small Indian woman did not return to join the others. 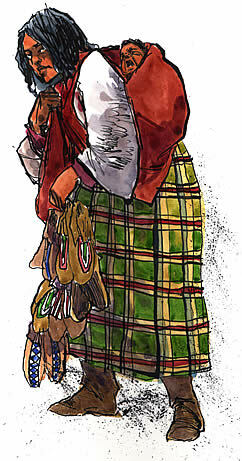 Concerned that the scout had been caught by the Comanches, a search party was sent out, but they found no sign of her. Another group was sent to look for her, and they found the scout dead at King's creek near the Clear Fork of the Brazos River. Texas had died only 15 miles northeast of her home. She was buried near the creek. Credits: Character dialogue by Lisa Waller Rogers; top painting by Charles Shaw; photo of beaded moccasin by Lester Galbraith, Fort Griffin SHS; Dutch Nance store, courtesy of Old Jail Art Center (Robert Nail Collection); photos of Tonkawa girls, boys, and Tonkawa village, courtesy of Lawrence Jones III.